My band, The Chop, created these costumes by hand, each one a Superhero costume. Aquaman – two layers of green tights, one black Speedo, a belt, cardboard (for the big "A"), yellow spray paint for the belt and the "A", a blond wig, an orange long sleeve t-shirt and green felt for the wrist bands. The Hulk – Black hair paint, green skin paint, yellow nail polish, ripped jeans and a ripped flannel shirt and flip-flops. Silversurfer – one bald cap, one Speedo, full unitard, spray paint the Speedo and unitard silver, silver skin paint for the head and hands. 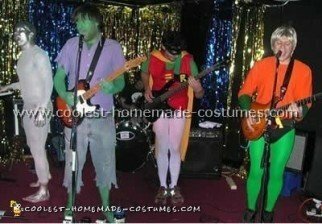 "Old School" Robin – two pairs of white tights, one black Speedo, one green t-shirt, hand made red felt vest, hand made yellow cotton cape and black felt eye-mask. The Punisher – simple just put The Punisher logo (a skull) on a black t-shirt with white felt.